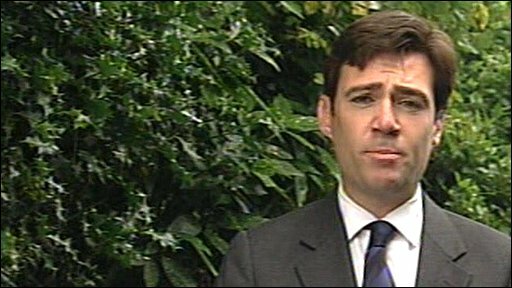 Health secretary Andy Burnham: "Mr Cameron looks rattled today"
Health Secretary Andy Burnham has accused a Tory MEP who attacked the NHS on American TV of being "unpatriotic". Labour has stepped up its criticism of Daniel Hannan, who waded into the debate over Barack Obama's health bill. They claim his view - that the NHS is outdated, unfair and should be scrapped - is shared by many Conservatives. But David Cameron said Mr Hannan's view was "eccentric" and accused Labour of making a meal of the row, stressing that the NHS was his top priority. Mr Hannan has made a series of appearances on American television in recent weeks, describing the NHS as "60 year mistake" and saying that he "wouldn't wish it on anyone". He has stressed that these are his own views and not those of the party - but they were backed by fellow Tory MEP Roger Helmer, who told BBC Radio 4's PM programme: "I think Dan has done us a service by raising these issues which need to be looked at. "If 80% of Americans are getting better health care than we are in the UK then we ought to ask why, and we ought to ask how are we going to deliver equally good results." Tory leader David Cameron, who has vowed to protect health from spending cuts if he comes to power, has been at pains to stress his commitment to the NHS and distance himself from Mr Hannan. 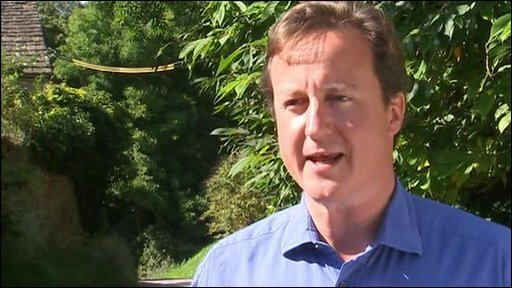 "The Conservative Party stands four square behind the NHS," he told BBC News. "We are the party of the NHS, we back it, we are going to expand it, we have ring-fenced it and said that it will get more money under a Conservative government, and it is our number one mission to improve it." And he rebuked Mr Hannan, saying: "He does have some quite eccentric views about some things, and political parties always include some people who don't toe the party line on one issue or another issue." The Leader of the Conservative group in the European Parliament, Timothy Kirkhope told the BBC he believes Mr Hannan should be disciplined for his comments about the NHS and said he would be given a "stern talking to" by the party's chief whip Brussels. But Mr Hannan's words have been seized on by Labour and the Liberal Democrats who have questioned the party's commitment to the NHS. Health Secretary Andy Burnham said: "What has happened within the last 48 hours is what Cameron has feared most because it lays bare the Tories' deep ambivalence towards the NHS." And he hit back at criticism that the government had not done enough to defend the NHS from attacks in the US, saying: "We will stand up for the NHS and we will make sure that it is properly represented in the international media. And that is why what Mr Hannan has done disappoints me so much. Former deputy prime minister John Prescott has recorded a video message to the American people accusing Mr Hannan of "misrepresentation of the NHS here in Britain". Earlier this week, Prime Minister Gordon Brown took the unusual step of adding his voices to the welovetheNHS Twitter campaign, set up defend the health service from US attacks. In a message posted from Downing Street's Twitter feed, the PM said "thanks for always being there". His wife Sarah, also sent a message of support to the campaign. US critics of the NHS claim it is an example of an overly-bureaucratic system which rations care and denies treatment to the elderly. But campaign groups and right wing pundits have also attacked it as "socialist", with one TV debate even discussing whether it was a breeding ground for terrorism. One British woman said she felt "duped" after becoming the unwitting star of an anti-Obama health campaign. Kate Spall, who appeared in a US free market group's TV commercial opposing Mr Obama's health bill, said her views were misrepresented. She told BBC Radio 4's The World at One: " "Absolutely I was deceived yes because when I then found out the link to the website and it was a huge political machine I was horrified because it was the polar opposite of what I believe in. I absolutely believe in universal health care." Ms Spall and fellow Briton Katie Brickell's descriptions of poor treatment at the hands of the NHS featured in the Conservatives for Patients' Rights (CPR) advert.